This community surrounds the Microsoft Corporation's campus in Redmond near Lake Sammamish. Microsoft sits between Northeast Bellevue and Bridle Trails, a rural Redmond neighborhood. In fact, many of Redmond and Bellevue's neighborhoods are conveniently located just minutes from Microsoft and State Route 520, one of the area's main arteries. Many types of homes for sale can be found here, single family residences in modest and high-end price ranges, as well as condos in private developments and open communities. 4 Beds | 3 Baths | 2357 sq. Ft.
2 Beds | 1.75 Baths | 1311 sq. Ft.
4 Beds | 2.75 Baths | 3058 sq. Ft.
4 Beds | 1.75 Baths | 1860 sq. Ft.
2 Beds | 2 Baths | 1080 sq. Ft.
3 Beds | 2.5 Baths | 1870 sq. Ft.
3 Beds | 1.75 Baths | 1062 sq. Ft.
3 Beds | 2.25 Baths | 1990 sq. Ft.
Blue Summit Realty has the most accurate and up to date Microsoft real estate listings on the web. Currently there are 7 homes for sale, 6 condos for sale, and 1 vacant land properties in Microsoft. Of the 14 total Microsoft residential listings for sale 0 are bank owned, 0 are short sales, 0 are new construction, and 0 are townhomes. The price ranges from $297,000 to $0 with a median list price of $681,146 and median sold price of $688,897. 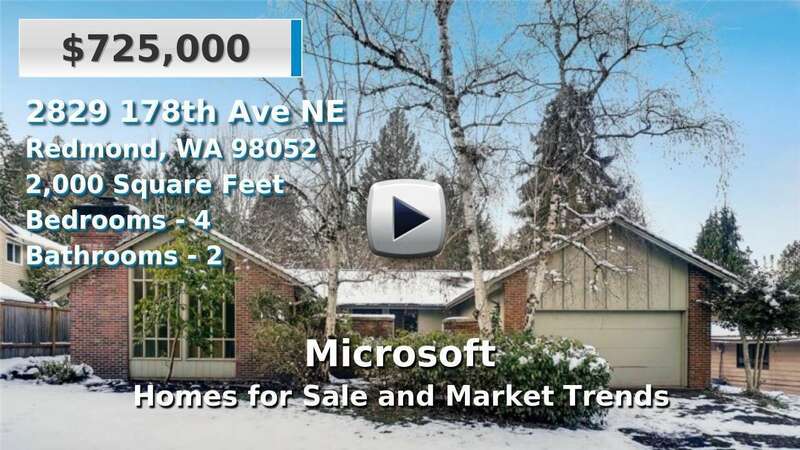 Make sure to refine your Microsoft real estate search by property type, price, square footage, bedrooms, bathrooms and more with the search tool above or view the Microsoft listings on our interactive map. Our Microsoft real estate listings were updated 27 minutes ago.